The North Brunswick Pub, or just “The Pub” as it’s known by the locals, is the place where people would go to kick back, unwind, and have a great time. Growing up in Jersey, I’ve been there a bunch of times and it was always packed almost elbow to elbow. So when the time came to meet up with an old friend and grab some grub, the decision was easy: Hop on Rt. 1 and head for The Pub (rhyme). The Pub is a decent sized place with a large bar area which is great if you like sitting at a stool like myself. It seems that times have changed, however, as I stopped in on a Saturday night and the place was dead. Bad if I came to socialize, but great if I came to eat some wings because this meant quick service. 🙂 And come for wings, I did. So, I took a menu and looked over the options. At first glance, I could see traditional wings, boneless, and baskets galore with a laundry list of sauces (though few were of the hot variety). But then I noticed something that irked me a bit. All of the sauces were listed under the boneless wings which came second to the traditional wings on the page. Personally I feel that the sauces should be listed under the wings and boneless should get a “See above” out of respect. Now, I know what you’re thinking,“Dude, chill out, really?” But what you don’t understand is that there used to be a day when I could order wings and get wings. Now when I order wings, I get “boneless or regular?” Or worse, I order regular and get boneless. It is just one more thing that steals the thunder away from the traditional wing. Ugh, totally sidetracked on a tangent; let’s get back to it. They serve their wings in groups of 8, so that is what I ordered tossed in Hot sauce with a side of “Pub’s Secret Sauce.” This sounded a bit dirty, but they assured me that it was safe for consumption. They also carried Mild, Honey BBQ, Red Pepper Basil, Garlic Parm and Pesto to name a few, but I’m in it for the flavor with a smack of heat that you can’t get from Garlic Parm. When my wings arrived they weren’t coated too well, and I had to ask for some more sauce to dump over top. Right off the bat, I could see that the size of the chicken was very inconsistent. There would be a nice sized drum pitted up against another drum half the size which caused my friend Mike to jokingly relate them to the time we went to Quaker Steak and Lube. Some good things to note, however, is that included in the basket was not only Blue Cheese, but Ranch as well. Also, there were both carrots and celery to boot. This is a great variety for those who have certain preferences… and that plus the paper plates and wet naps are worth noting. The sauce was a nice mix of peppers, garlic and what I think… don’t hold me to it, but I think was ginger. I’ve had ginger mixed with the sauce on wings in the past, and they were overwhelming, but if there was ginger in this sauce, The Pub added just enough to make a point but not overdo it. The peppery notes were good as well, but I was looking for just a bit more flavor from this sauce to put these wings up to a new level. Perhaps a little honey or something to cut down on the acidity. The “Pub’s Secret Sauce” was nothing more than a smoky BBQ, which if it had any heat to it, was very little to untraceable… and seeing how I was here for Buffalo wings, I quickly moved back to the Hot sauce. 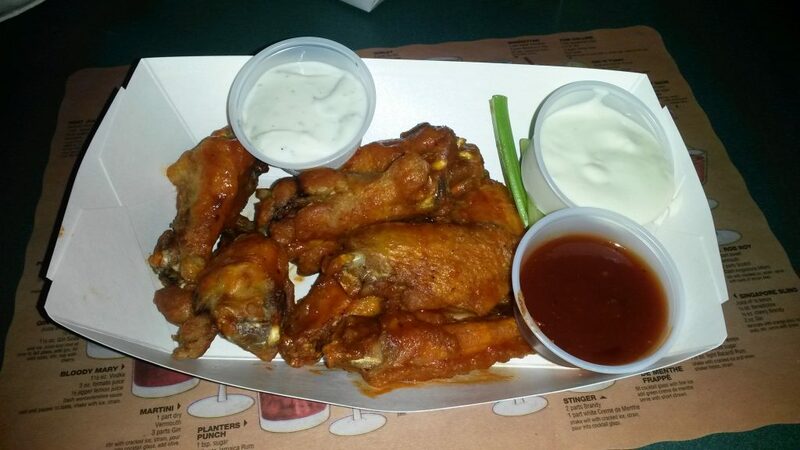 Overall, the North Brunswick Pub seems to try and please everybody by offering multiple sauces, supplying both Ranch and Blue Cheese, and offering both bone-in and boneless wings. These are all great things because you can go out with your buddies and there are plenty of varieties to choose from. But what good is all of that extra “wing glam” if the wings themselves still need a little more work? Double checking consistency and tossing the wings a bit more in the sauce before leaving the kitchen are just two small things that can be done that would make a world of difference. And though the wings weren’t up there with the best, they were definitely better than the typical wings you would find at a similar place. So, I leave you with that… they were good.